A trio of big name businesses originally hoping to open in Coney Island by Mermaid Parade Day, which marks the start of summer, have now set their sights on July and in one case August. Wahlburgers, IHOP, and Boston Beer Corp’s Coney Island Brewery have held job screenings but remain under construction. Amid the influx of new businesses, there is one that is returning to its Stillwell Terminal store more than 2-1/2 years after being devastated by Hurricane Sandy! 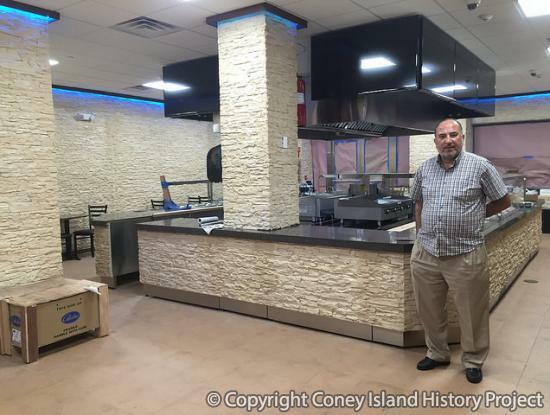 Coney Island Gourmet, a Mom & Pop owned by Turkish Americans, is being renovated and expected to reopen as Magic Gyro in July. 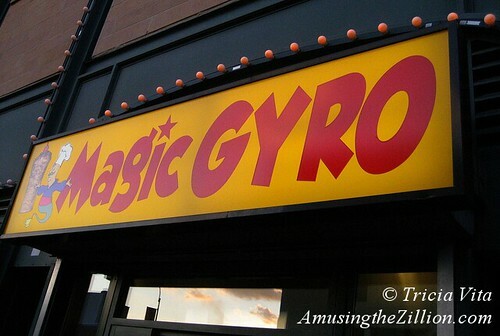 When ATZ reviewed the store in August 2012, it had a corner kitchen and a “Magic Gyro” sign on the Stillwell Avenue facade. In addition to chicken and veal sandwiches and entrees served with rice and salad, the menu offered falafel, hummus, babganoush, haydari (yogurt flavored with garlic, herbs and olive oil) and stuffed vine leaves, all very reasonably priced. The store will no longer feature a food shop and is being renovated as a restaurant. 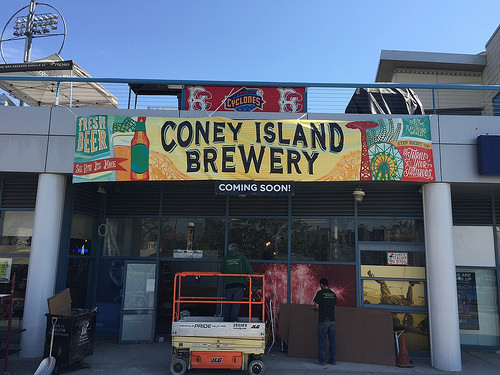 At 1904 Surf Avenue, the Coney Island Brewing Company, whose craft beers celebrate the iconography of Coney Island, hopes to officially open its doors in mid-July. The brewery is located in a retail space on the outside of MCU Park adjacent to Peggy O’Neill’s. “We’re excited about the opportunity,” Kathleen Barnes of the Coney Island Brewing Company told ATZ earlier this year. She said they’re planning to have a tasting room, retail space, a community center, and tours of the brewing process. Draft beers will be sold in growlers. Retail items include Coney beer-themed tap handles, coolers, beach towels, T-shirts and trucker hats. The line of Coney Island beers was relaunched in 2013 after being sold to Alchemy & Science, a division of Boston’s Samuel Adams. Further east on Surf Avenue, across from Luna Park, the construction of IHOP in a 5,400-square-foot store has been delayed by the slow approval process for building department permits. “While waiting patiently the franchisee is going forward with his soft core work. He should be open late August,” says Joe Vitacco, who leased the space to the pancake franchise in February. 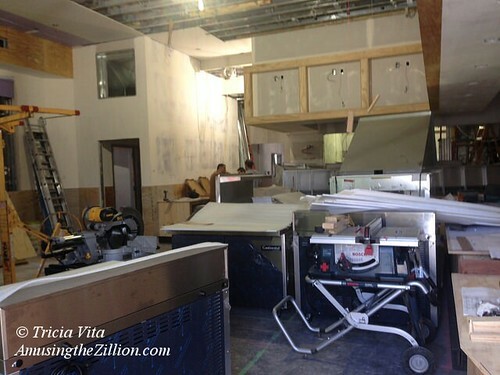 Meanwhile, in Thor Equities “Retail Ride of A Lifetime” building on Stillwell, a quick peek inside Wahlburger’s Coney Island shows the 6,800 square foot Wahlburgers franchise to be far from finished. Asked when the celebrity restaurant would open a worker said, “Next month, by the Fourth of July.” The latest post on the eatery’s Facebook page says “The family is coming to town,” referring to actors Mark and Donnie Wahlberg and Chef Paul Wahlberg. The most recent photo is a snapshot of the view from their rooftop dining area. Can the A&E crew be far behind? Season 4 of Wahlburgers premieres on July 15. The reality show comes to Coney! 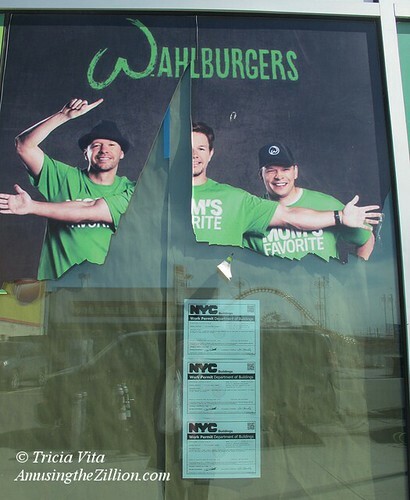 Wahlburgers Coney Island sent out an invite from the Wahlberg family to a private VIP Preview and Ribbon Cutting on June 23rd. After weeks of rumors and negotiations, it’s finally official: the lease for a 5,400 square foot IHOP at 1019 Surf Avenue in Coney Island was signed on Thursday, broker Joe Vitacco told ATZ. The franchisee who will be operating the restaurant is Bryan McKenzie, who owns an IHOP in New Jersey. Construction is expected to take about four months after the landlord completes the vanilla shell. 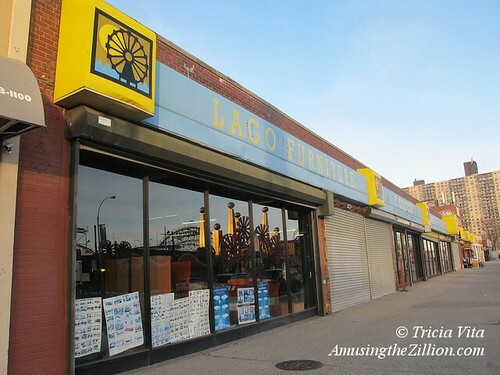 The one-story building at 1019 across the street from Luna Park is a longtime furniture store, which is not among the use groups permitted by the zoning. The space is being subdivided into six storefronts by the landlord and the stores are in the process of getting new street numbers. IHOP will combine the three stores on the far left and the soon-to-open Subway Cafe has the one on the right. Two remaining storefronts totalling 3,000 square feet are expected to be snapped up by another franchisee. Why is Surf Avenue becoming a mecca for franchises? 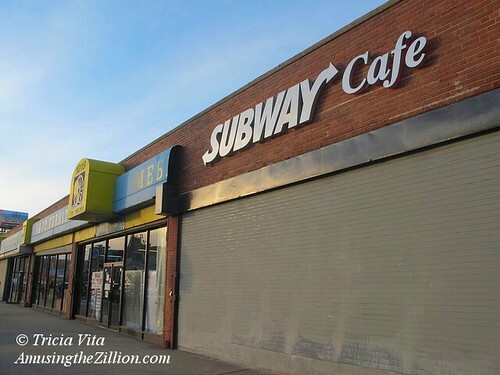 “The franchise is a preference of the landlords in Coney Island,” says Vitacco, who has leased space on Surf Avenue to Johnny Rockets, Subway Cafe and Rita’s Italian Ice, as well as to Brooklyn-based bakery Piece of Velvet for their third store. On Mermaid Avenue, he has leased to such Mom & Pops as a fish store and a Chinese bakery, as well as a Jamaican patty store franchisee. “First of all, the franchisees are better funded. They are required to have half a million to two million in assets. They are trained and helped by the franchise company and have a high chance of success.” Many also own multiple businesses, which enables them to spread the risk. The Johnny Rockets franchisee owns several other franchise restaurants, Vitacco says. Unlike Manhattan, where Mom and Pops are being forced out by landlords who triple the rent and then turn around and lease to chains or upscale businesses, many of the new franchises on Coney Island’s Surf Avenue are replacing illegal furniture stores which have existed for years in defiance of the zoning. Amid the influx of already opened national chains and franchises such as It’Sugar, Applebee’s, Rita’s Italian Ice, and Dunkin’ Donuts on Surf Avenue, there have also been a few new Mom & Pops like Lunatics Ice Cream and Luna Park Cafe, which have no connection to Luna Park. –Open and enclosed amusements with limited accessory retail. Amusement uses would also include virtual reality and simulated gaming, dark rides, recreational sports facilities and water parks. –Restaurants of any size, including those with entertainment and dancing. It would also include other complementary uses to amusements uses such as performance venues, bathhouses, breweries, tattoo parlors or wedding chapels. –Retail and service uses complementary to amusement uses and beach activities such as arts and crafts production and sales, bicycle sales and repair, gift shops, and beach furniture stores. These uses would be limited in size and frontage. 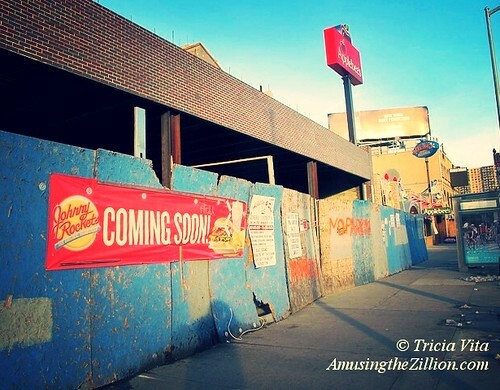 More than two years after ATZ posted “Will Coney Island’s Surf Ave Become a Mecca for Franchises?” (December 19, 2012), the trend continues. Across the street from Luna Park, an IHOP is finalizing a deal to open a pancake restaurant while a Subway Cafe has their sign up and is set to open a year-and-a-half after signing a lease. New FEMA regulations after Sandy are partly to blame for construction delays at Subway Cafe, a restaurant concept featuring “Tuscany-style decor” aiming for a “coffeehouse ambiance” and a layout a little larger than an average Subway. 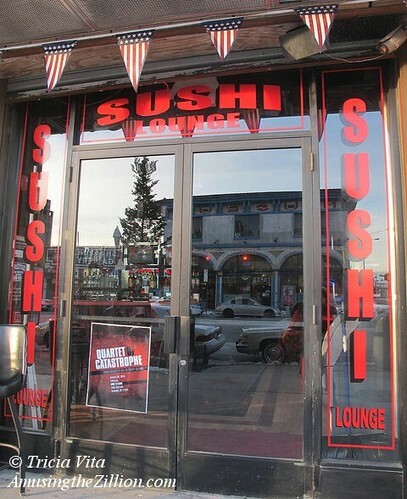 Sushi is coming to the corner of Surf Ave. and West 12th Street, across the street from Coney Island USA. Shalyapin Wonderwheel Karaoke (no connection to Wonder Wheel Park) morphed into Surf 12 Club and Lounge, which features live music, but their newest sign says “SUSHI LOUNGE.” A spokesman told ATZ they wanted to do something different. A new display case stood ready to serve desserts. Quartet of Catastrophe will play on Friday at 9:30pm. Applebee’s, which opened in June 2013, has proven popular with locals and extended its hours. Multiple signs on the street and one in the sky announce they now serve breakfast daily from 8am till 12 noon. A sideshow banner for Gary Dreifus’ “Magic at Coney!! !” graces the window. 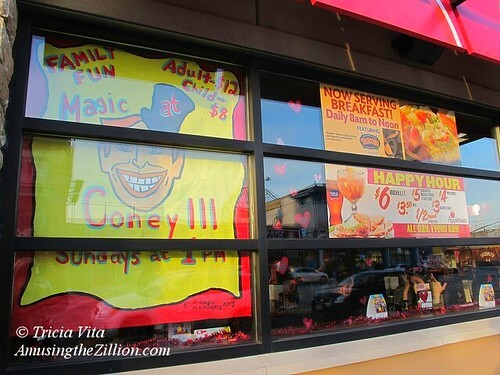 After completing its run at Coney Island USA, the magical variety show has moved across the street to Applebee’s second floor for Sunday performances in the winter. Unlike Manhattan, where Mom and Pops are being forced out by landlords who triple the rent and then turn around and lease to chains or upscale businesses, the new franchises on Coney Island’s Surf Avenue are replacing illegal furniture stores which have existed for years in defiance of the zoning. Until the early 1980’s the north side of Surf was home to individually-owned penny arcades and a variety of rides including bumper cars, carousels and even a Jumbo Jet-style coaster. By the time the last ride– Coney Island’s B & B Carousell — closed in 2005, the north side was known as the wrong side of Surf Avenue to locate a business because of the lack of foot traffic. Not any more. 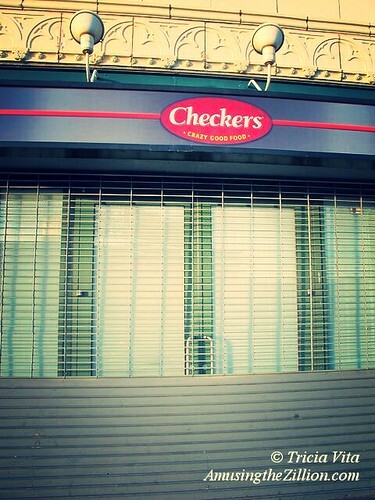 Two other previously announced and long under construction franchises that are expected to open in 2015 are Checkers in Stillwell Terminal, which has finally put its sign up, and its next door neighbor, Johnny Rockets. Like Subway Cafe, these businesses have been delayed by new and ever-changing post-Sandy building regulations. Johnny Rockets is waiting for approval of a storm surge resistant front to resume construction. 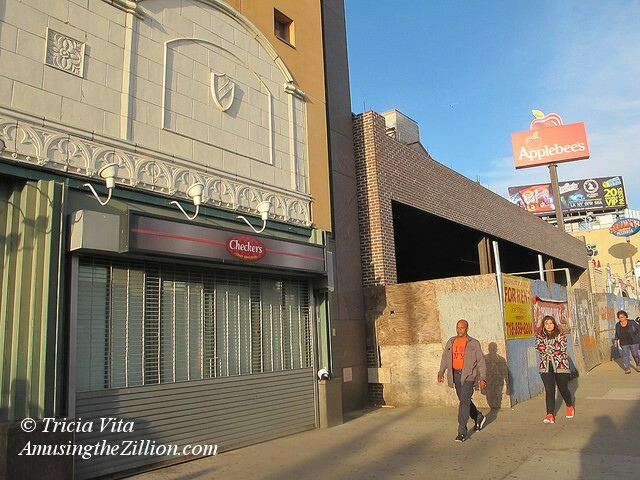 Just off Surf, on Stillwell Avenue, Thor Equities’ retail building is the site of New York City’s first Wahlburgers –Donnie, Mark and Paul Wahlberg’s burger franchise– opening in May and written into the script of the Wahlberg’s reality show on A & E.
The Coney Island Brewing Company, whose craft beers celebrate the iconography of Coney Island, may soon have a place to call its own on Surf Avenue. Boston Beer Corporation, which applied in September for a license to open a brewery under the trade name Coney Island Brewing Company at 1904 Surf Avenue, received a conditional letter of approval from the NY State Liquor Authority last week.